Lendlease Chairman, Mr. Dinesh Nambiar and Federal Territories Minister of Malaysia, Yang Berhormat Tuan Haji Khalid Samad (in the middle), with the winners of the ‘Projek Komuniti Kita’ futsal tournament. To the right is the Mayor of Kuala Lumpur, Yang Berbahagia Dato’ Nor Hisham Ahmad Dahlan. Lendlease Project Director for The Exchange TRX, Mr. Brendan Walker is on the far left of the image. This futsal tournament was the culmination of a series of futsal workshops run by Lendlease for the children of ‘Perumahan Awam’ Sri Selangor. 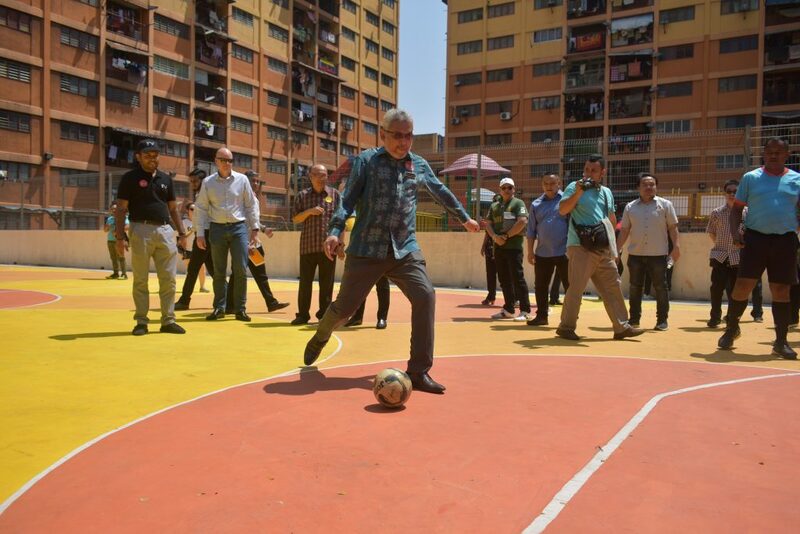 Kuala Lumpur, March 2019 – Two (2) local public housing communities in Kuala Lumpur received support from Lendlease through ‘Projek Komuniti Kita’- a community partnership project in collaboration with local social enterprise, Surprise Ventures. The project aims to support local community growth and development through infrastructure enhancements and upgrades, arts, culture and sports. 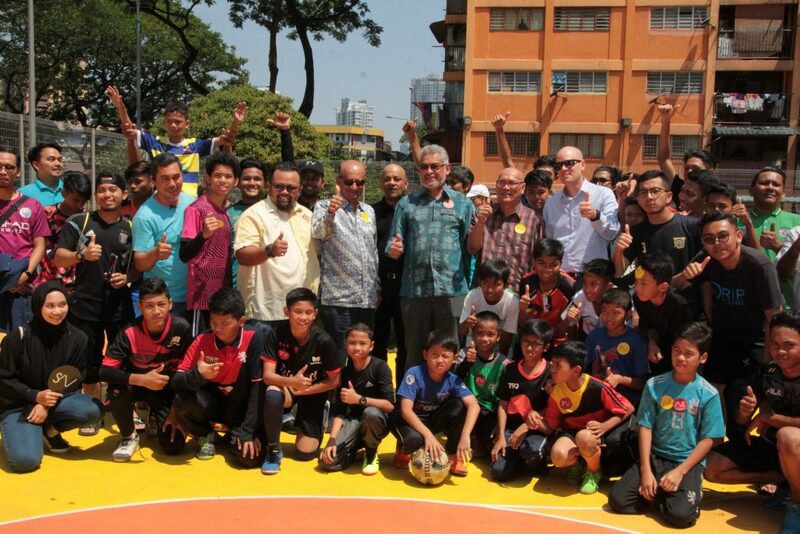 Perumahan Awam (PA) Sri Selangor and PA Hang Tuah were the first beneficiaries of the program which received refurbishments to their futsal courts, breathing new life into the community’s common gathering space for recreation and sports. Opportunities for children living within these communities to learn and play such as Futsal clinics, arts and crafts workshops and theatre classes were also conducted over the past four (4) weeks. Federal Territories Minister of Malaysia, Yang Berhormat Tuan Haji Khalid Samad (in the middle) along with Projek Komuniti Kita futsal tournament finalists. Both teams were made up of children who took part in futsal workshops recently organised by Lendlease. On the right is the Mayor of Kuala Lumpur, Yang Berbahagia Dato’ Nor Hisham Ahmad Dahlan and Lendlease Project Director for The Exchange TRX, Mr. Brendan Walker, while Lendlease Chairman, Mr. Dinesh Nambiar is on the left (of YB Khalid). Federal Territories Minister of Malaysia, Yang Berhormat Tuan Haji Khalid Samad kicking off the final match of the futsal tournament at the ‘Projek Komuniti Kita’ Carnival while Brendan Walker, Project Director of The Exchange TRX and Dinesh Nambiar, Chairman of Lendlease cheer on. The tournament saw participation from children who attended earlier futsal workshops organised by Lendlease. Lendlease is a leading international property and infrastructure group. The company has a long and proud history of giving emphasis to environmental, social and economic outcomes to deliver places that respond to the complex global forces shaping the future, including rapid urbanisation, climate change, inequality and resource stress. 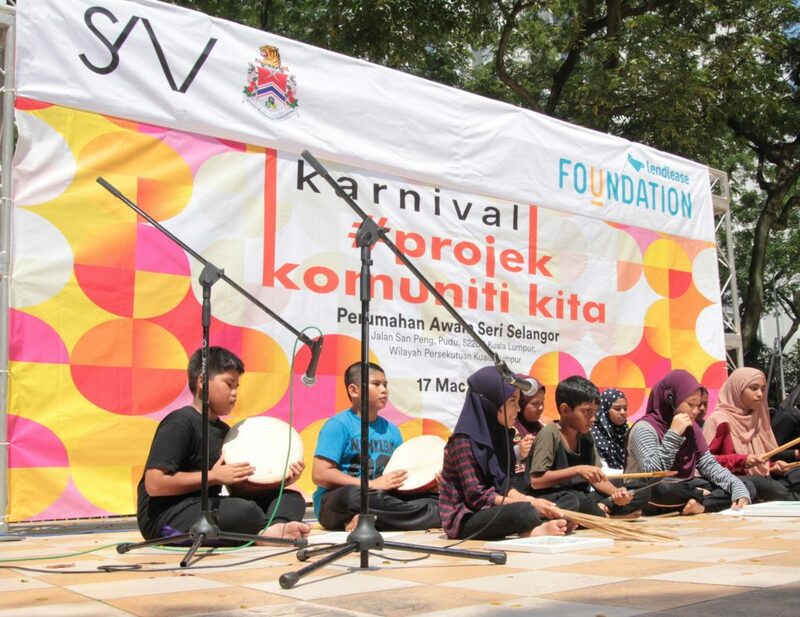 Children from ‘Perumahan Awam’ Sri Selangor performing the ‘dikir barat’ and delivering a traditional ‘sajak’ at the ‘Projek Komuniti Kita’ Carnival. This performance was the result of three fun-filled theatre workshops organised by Lendlease.